Tarps Plus Blog: Tarps, All You Need To Know About Them. A Tarp is a widely used product that many people find handy when dealing with certain situations. There are many different size tarps in the world, as well as different materials that they are made out of. This simple article is written to give you some insight into who uses tarpaulin, why, when, where and how they use it. The use of tarps can be used by almost anyone. There are hundreds of different people around the world who use them for their jobs, for their homes and even for events that may be outside. These people can be from trades men, farmers, construction workers, office workers, to just ordinary mothers and fathers. 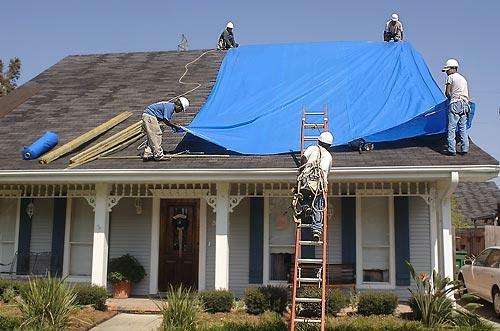 Many people use tarps because of its ability to help protect things from the weather and other circumstances like theft. Certain tarps are made out of different materials like canvas and polyethylene top name a few. The different materials indicate the different uses to whether they are for long term outdoor use or short term. People tend to used tarps where there is a need to protect something. If a house has been damaged due to storms or other incidents, then a tarp may be used to help shield the damaged area from rain and water. Other places where a tarp may be used is on farms, for the cover of loads on the road, around the house or garden and many other places. To use a tarp you usually have to throw it, or tie it up over the object that needs protecting or shielding with ropes or strong string. Another method of holding a tarp down is by placing bricks and other heavy objects like cement bricks on them. When it comes to buying a tarp for your needs, you need to work out what it will be used for and the strength you need it to be. If you work this out before buying, you should be able to find a tarp that is suitable. Just wanted to drop by and say thanks for the tarps as quick as you got them here. You guys really helped us out.